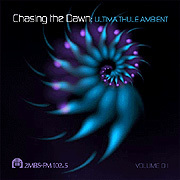 Chasing the Dawn (78'08") is a compilation of various artists in electronic sound who help define the Ultima Thule radio program. Making up this anthology are thirteen tracks, donated by as many artists, of original Ambient soundscapes. This music represents that which may be found on a typical broadcast of Ultima Thule, which presents recordings from the Atmospheric, Ethno-Ambient and Spacemusic genres. The cast of Chasing the Dawn is an interesting representation of contemporary innovative composers, and their meticulously crafted sound designs should still even the most active of today's constantly moving minds. Tim Story opens the album with "Otherize" which references his more peculiar collaborative work and crossfades into "Salila", a meandering and amorphous piece by Matt Borghi. The wandering crystalline melodies of "Drawn from Sleep" by Delicate Systems is followed by fellow Australian Amongst Myselves who provides "Distant Horizons", a soft and warm multi-layered impressionistic composition of drifting beauty. Robert Rich and his piece "Qatifan" lead the mood to a subterranean cavern of tuned stalactites, reverberant choir and distant flute. Exiting into the jungle-covered ruins of Kelly David's "Temple of Dawn", the tone turns toward the remote power spot of his inspiration. With cool textures and ambience Jeff Greinke offers "5000 Falling Souls", and something from his gentler side in a somber work of beautiful harmonies and elegant timbres. On "Falling Water" Thom Brennan seeks to create music with an emphasis on his relationship with the forces of the natural world. Robert Scott Thompson finds old and new truths in his artfully woven Eno-inspired sonic meditation "Ascent". On "The Way Beyond" Jim Cole adds to the already diverse line-up with the shifting layers and ceremonial feel of sustained overtone singing. Working with the sounds of night on "Between States" is Dan Barrio, whose spare guitar loops and deep synth drones seem the perfect companion in sleep. The resonant melodies of Steve Roach's "Approaching Kata Tjuta" hide in huge vaporous spheres of sound while, at this collection's conclusion, "Red Stone, Black Sky" by Numina provides the listener with a wondrous sonic sanctuary in which to reflect upon their own inner workings; as is the goal of Chasing the Dawn and its on-air parent radio show Ultima Thule.